How do we know service dogs help veterans with PTSD? Veterans with post-traumatic stress disorder say service dogs save their lives. The problem is, it's hard to show quantifiable research that proves it. A Purdue University researcher is working on doing just that. 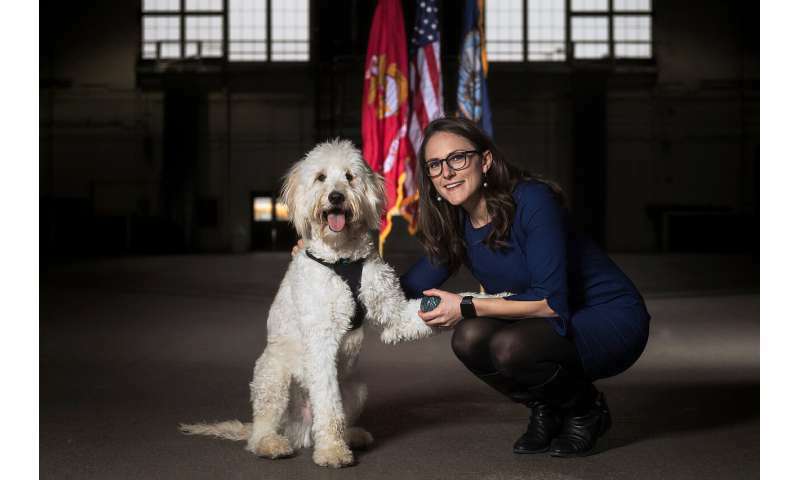 Maggie O'Haire, associate professor of human-animal interaction in the Purdue College of Veterinary Medicine, has been leading research that has revealed how service dogs might offer both physiological and behavioral benefits to veterans. O'Haire's research is the first data of its kind. "I hope we are giving veterans a voice through science," O'Haire said. "People have been looking for answers for years, and this is a way to find the answers they've been looking for." The number of veterans with PTSD varies by service era. About 11-20 percent of operations Iraqi Freedom and Enduring Freedom veterans, 12 percent of Gulf War veterans and 15 percent of Vietnam veterans have PTSD within a given year, according to the National Center for PTSD. "A common thing I hear from veterans with service dogs is, 'I can actually leave my house now,'" O'Haire said. "It's not uncommon to hear how these dogs are changing their lives, but there is finally data that is starting to show that change can be real. I think it will continue to give more veterans hope and information." In 2014, O'Haire started digging into what she thought would be extensive existing research about service dogs and veterans. As it turns out, O'Haire was on the verge of something new. "We wanted to start off by making a report that detailed what the science says, because there are really long waiting lists for these dogs and there are high expectations for them," O'Haire said. "But the science just wasn't there." O'Haire's early research focused on the positive correlation between animals and children with autism. About four years ago, she started focusing on how service dogs help veterans. "I'm always looking at areas where there is a need, and more and more people say, 'I think this is helping,' but we just didn't have the science behind it," O'Haire said. "Our goal was, and still is, to make a rigorous assessment to see it if actually makes a difference and how, so families and the public can understand what to expect, and if it does work, how we can make it better." O'Haire led a preliminary study that took place in 2015-16, which showed that overall symptoms of PTSD were lower among war veterans with service dogs. The pilot study was co-funded by the Human Animal Bond Research Institute (HABRI) and Bayer Animal Health. The study examined 141 veterans—with 76 of them having a service dog and 66 being on a waiting list for a dog. O'Haire led that study with the help of K9s For Warriors, a nonprofit organization that provides veterans with service dogs. The pilot research project provided scientific evidence of mental health benefits experienced by veterans with PTSD who have service dogs. The findings during that study also went beyond behavioral benefits and assessed cortisol levels because it is a biomarker in the stress response system, O'Haire says. For veterans with service dogs, their cortisol levels grew higher in the morning than those who were on the waiting list. People without PTSD typically have rising cortisol levels in the morning as part of their response to waking up. O'Haire's research has also revealed that for veterans, having a service dog was also associated with less anger, less anxiety and better sleep. Another phase of that study, funded by Merrick Pet Care and Newman's Own Foundation, examined the dogs themselves and how they are incorporated into the treatment of veterans. That data is being analyzed. A large-scale National Institutes of Health clinical trial led by O'Haire has been ongoing for about a year and has two years left. The clinical trial consists of studying veterans with and without service dogs over an extended period of time. O'Haire hopes the trial, which is also funded by the Petco Foundation, will reveal a better understanding of physiological and behavioral processes, PTSD symptoms and service dogs in general. The idea of service dogs for veterans has been a largely debated issue, O'Haire said, mostly because there has been uncertainty about whether and how the dogs help veterans. O'Haire's research is proving that there are in fact benefits – and her hope is that the ongoing research will continue to provide more answers. "It's not a cure, because we can't expect to get a dog and cure autism or PTSD," O'Haire said. "But for some people, it is helping in a way that is unique. We have data that shows it can make a difference."